There is a paradox that most of us face in our lives and hockey is no different. You need experience to get the full-time job for your career but you have to get the job to have that experience. The Pittsburgh Penguins have shown this to be true at the NHL level as their head coach Dan Bylsma and the rest of the organization haven't been too kind to their young players that they're supposed to be trying to develop. There's been more than a few good reads on the downfall of Ray Shero when it comes to drafting and developing young forwards. The jury is still out on first-round pick Beau Bennett, who is expected to rejoin the lineup any day now. Another young forward, although not drafted by Shero, is Jayson Megna, who in my opinion has done enough to earn more playing time and a permanent role with the Pens. Depth has been an issue all year. Search "Pens bottom-six" on Google and/or Twitter and you'll see enough charts and stats to make you cry if you're a Pens fan. The bottom-six has been brutal. Depth was an issue at forward for the Pens before the season even started. Then Pascal Dupuis got injured. Beau Bennett was supposed to step up and become a top-six winger this season so far he's missed 53 games and counting. Evgeni Malkin has missed 11 games and James Neal has missed more than 20. The Pens went out and acquired two veterans in Lee Stempniak and Marcel Goc, both of whom have and will continue to help bolster the depth at forward. That being said.....There is still some moves that the Pens can make internally to improve their roster. Even with the news that Bennett will be back, and the return of Chris Kunitz and James Neal, the Pens should still have a spot for Megna. Megna has played 26 games for the Pens this season and has eight points and five goals. For the most part, Megna has been scratched in favor of Joe Vitale, Craig Adams, Deryk Engelland, and even Taylor Pyatt. Pyatt, for some reason is still on the team. On Wednesday, the Pens sent Megna back to the AHL. A puzzling move to me, considering that if they were trying to make room for Bennett's return, they could have put Pyatt on waivers. I have no idea what the Pens like about Pyatt. Mind you, I have nothing personal against Pyatt. In fact, when they first claimed Pyatt off of waivers, I was actually intrigued by the move. Pyatt had once scored 23 goals in a season, makes less than $2 million, and was supposed to be able to add size and grit. Size alone, Pyatt has added nothing of value for the Pens. He's slow, doesn't use his size nearly enough, has just two points in 23 games, and is a -14. 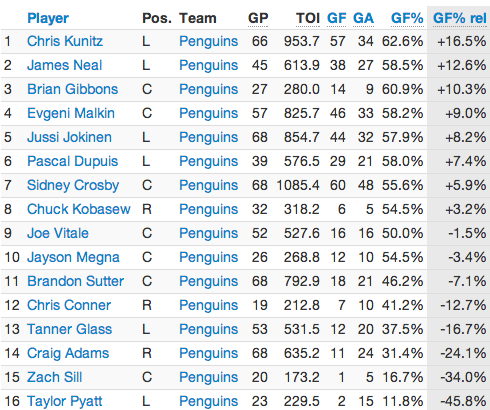 The Pyatt experiment is a complete failure but the Penguins are acting way too stubborn to admit that. For better perspective, here's where Pyatt and Megna both stack up in goals for relative to when the player is not on the ice. Tuesday night, the Pens defeated the Dallas Stars 5-1 and it was the first night all four lines were rolling and contributing. Having Brandon Sutter and Marcel Goc as your third-and-fourth line centers will do that. I do like Gibbons on the team, Gibbons has good possession numbers and his speed certainly allows him to play on almost any line. Gibbons has also shown value to the team by drawing a good number of penalties on a consistent basis. As for Megna, despite having a small sample size, between his grit, speed, possession numbers, and his actual on-ice production, he has definitely shown enough to have a spot in the lineup every night. Yes he is young and inexperienced and he will make mistakes. But Hell, the Pens have had aging-less-skilled forwards making mistakes on the ice all year. Wouldn't you rather have a younger, faster, player with more upside making mistakes instead? The snubbing of Megna doesn't do Bylsma any favors when it comes to the narrative that he favors less-skilled veterans that have a good work ethic, ala Craig Adams. Or an even worse example, Taylor Pyatt. Small sample size, but look at Megna versus the rest of the bottom-six forwards. Megna has also shown a lot of versatility. He didn't look completely out of place playing with Evgeni Malkin earlier in the season and he has enough size and grit to play a grinder-type role on the bottom-six. Considering his skill-set and his journey into the NHL, Megna looks like a poor-man's version of Chris Kunitz in my opinion. And that is not an insult to Kunitz or Megna. The Pens need to utilize their speed, skill, and possession time on their bottom-two lines. That's how they won the cup in the past. Not by blocking tons of shots and hitting everything that moves. You can still have a gritty team with speed and skill, look at the 2008-2009 team. Also, based on what has taken place this season, you have to imagine that there will be more injuries to come. Would you rather have Pyatt and/or Engelland playing forward if that happens or would you rather have a skilled Megna who can play on any line needed? The Pens had Pyatt on Malkin's line last week over Megna which is just an insult to everyone that is remotely involved with the Pens. What is that supposed to say to Megna or any other future forward of the Penguins? "Hey you can do well when given a chance but that still might not lead to promotion." At some point, the Pens need tom embrace their youth. So the questions are raised... What does Megna have to do to earn a full-time spot in the Pens' lineup? What is the effectuation with the Pens and Pyatt? When will the Pens embrace youth and speed? Who knows, but one thing I do know is it's time to free Megna. Right on! I think I can skate faster than Pyatt. He's a big body with lacking puck handling skills. He doesn't contribute that much in the hitting for his size because he is too slow. The team needs more youth. Orpik and Scuderi are old, tired and for the most part ineffectual at clearing the puck. They are caught many times by opposing players taking a turnover in the offensive zone and going up ice. Let's see Samuellson or Pouliott, can't be any worse than what they have now. Young fast forwards will win the cup. Thanks for pointing the finger at Brooks Orpik. I am tired of hearing how great he is when he slams an opposing player. Doug Murray was fun to watch too, but did he help the team? NO. Without Paul Martin, Orpik spends more time watching the puck go into the net rather than having the goalie's back. Time to make some changes and bring in some youth.